On 14 May 1610, while proceeding in his carriage along Rue de la Ferronerie in the centre of Paris, King Henry IV was assassinated by Francois Ravaillac, a Catholic zealot from Angouleme. It appeared that Ravaillac had prior knowledge of the Royal route, and when the way of the King’s entourage was blocked by two carts, Ravaillac seized the moment, leapt out from the crowd, and delivered the regicidal thrust, between the second and third ribs, that brought the King’s reign to an abrupt and premature end. The most advanced methods in barbaric torture loosened everything apart from Ravaillac’s tongue, and before the dismembered parts of his anatomy finally went to meet their maker, they steadfastly refused to acknowledge any part in a plot. However, whilst Ravaillac had been lodging in Paris awaiting his opportunity, he stayed in the house of the mistress of the Duke d’Epernon, another staunch Catholic, and confidant of the King. Epernon would have had access to information about the King’s proposed journey on that fateful day, and was widely suspected of being the mastermind behind the murder. Whoever was responsible, the assassination came too late to save the Chateau of Vergy, which for 1,000 years had crowned the top of the small hill, just behind the Cote, and been the fiefdom of one of the most powerful and influential Catholic families in Burgundy and France. The demolition, which started in 1609 on the orders of the King, was intended to destroy the power base of the members and supporters of the Catholic League, a group of zealots, responsible for seeking to stamp out the Protestant religion in France during the Religious wars of the second half of the previous century. One of the fourteen towers dedicated to St Denis was left in tact, and also spared was the Church on the northern side of the hill dedicated to St Saturnin. Otherwise the King’s forces took down the whole caboodle, one enormous block at a time. 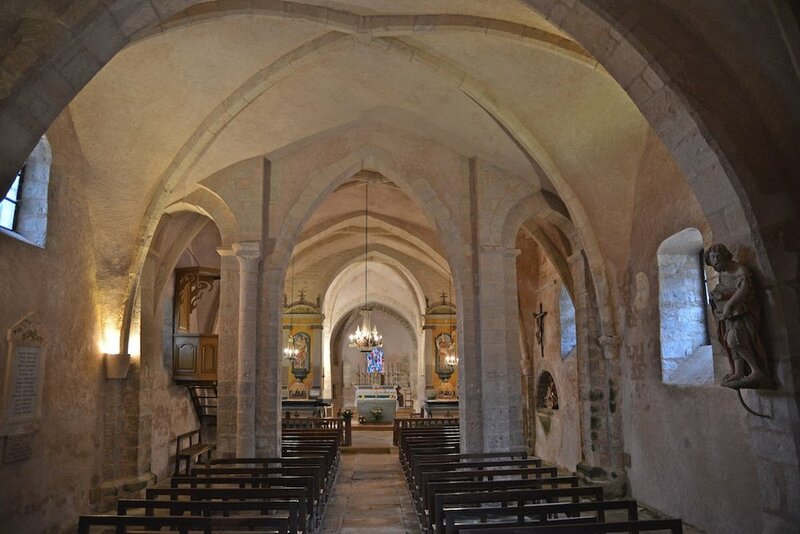 The interior of St Saturnin is fabulous, but sadly access can be something of a challenge. It was fashionable in the Middle Ages for noble families to attach themselves in one way or another to a religious order. Often one of the sons of the family would be required to forego the pleasures of the flesh, and devote his life to less worldly pursuits. The members of the Vergy family did not need any such persuasion. Humbert de Vergy, who was Bishop of Paris between 1030 and 1060, was responsible for bringing the decapitated head of St Denis to the Chateau of Vergy from its previous resting place in Paris. One of the towers of the Vergy chateau was dedicated to the good Saint, and a body of followers called Chanoines, took up residence within the Chateau walls in order to pay permanent homage. The Vergy family provided the Chanoines with land in the village known as Morey, where they planted their vines, which became known as Clos St Denis. In 1927 Morey changed its name to Morey St Denis, adopting the name of its most famous Clos. On the other side of the hill, the family gave some land to the followers of St Vivant, and the good monks built their Abbey on the hill. Later they acquired land in Vosne, which now comprises the domaine of Romanée-Conti. The hill and the Abbey were therefore the birthplace of the world's most famous, (and expensive) wine. A fund raising exercise has been ongoing for the last 20 years, to pay for the preservation and limited renovation of the Abbey. But if the owners of Romanee-Conti are not willing to finance the preservation of their heritage, it is difficult to see who else might pick up the baton. Dommage!